With sincerity and hard work of our professionals, we have carved a niche for ourselves in this domain by providing premium quality gamut of Solid PVC Door Service. Our professionals have decorated the interiors.which has been given a beautiful artistic look by our designers. The place is decorated with beautiful artistic designs for attracting the customers while creating a cultural ambience for giving shoppers an ethnic experience. Our company is master in providing Aluminum Doors Design. 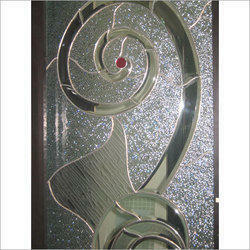 Being a leading enterprise of this industry, we are offering Glass Door Designing Service. The definition for the doors has changed as first impressions are the lasting ones and the front entry makes a statement about the house. BAY windows EN Series hinged patio doors give you traditional French styling with the convenience and durability of fiberglass door panels. Low-maintenance premium quality uPVC protects the frame and sill from the elements. For added style there is a wide range of grille, hardware and patterned glass options. hINCASA offers a unique collection of top quality Italian doors. Our wide range of glass, wood and metal doors is made from the finest raw materials, perfectly finished and accurately installed. With our firm commitment to quality, we are involved in providing PVC Door Service to our esteemed clients. These PVC Door Services are executed under the supervision of our team of skilled professionals. Apart from this, these services are delivered within the stipulated time period at cost effective prices.